February 27, 2019. Donald Trump and Kim Jong-Un greet prior to a bilateral meeting Hanoi.Shealah Craighead/White House/Press Association. All rights reserved. 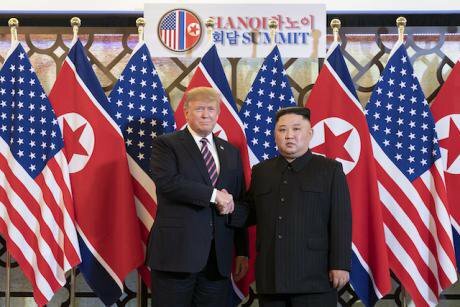 Meanwhile, the summit between US President Trump and North Korean leader Kim Jong-un has ended in failure, purportedly over sanctions, a frequently used weapon in US diplomacy. Trump was prepared for small reductions but Kim wanted more, as the price for dismantling North Korea's nuclear programme. Their failure to make progress also carries a high price, along with renewed risks. As Trump flies home to face allegations made by his former partners in crime, it will be up to Kim and the president of South Korea, Moon Jae-in, to take forward the regional security, denuclearization and peace treaty that Korean people ardently desire. Proposals from networks such as #KoreaPeaceNow and Women Cross DMZ provide ideas and support for making tangible progress. While US involvement is important, Trump's problems cannot be allowed to block or derail these hopes. With regard to denuclearizing the Korean Peninsula, the Nobel Peace Prize Laureate International Campaign to Abolish Nuclear Weapons (ICAN) published a useful roadmap in which the necessary denuclearization steps are underpinned through existing treaty obligations, through the Comprehensive Test Ban Treaty (CTBT), the Treaty on the Prohibition of Nuclear Weapons (TPNW), and the Non-Proliferation Treaty (NPT). Between them, these multilateral treaties have the authority and resources to ensure implementation, verification and accountability. Even as efforts were being made to resolve Korea's security problems, another nuclear flashpoint reminded us of the terrifying risks attached to nuclear weapons. With arsenals of around 130-140 nuclear weapons each, packing explosive yields of between 12 kilotons (similar size to the Hiroshima bomb) and 50 kt, India and Pakistan have been running a dangerous nuclear arms race since they both conducted nuclear tests in 1998. They are close neighbours with deep levels of distrust, who were divided in 1948 in ways that have exacerbated religious and cultural differences. Both have violent extremists and populists who whip up public hatred of the other, fomenting problems for the respective governments, and constituting volatile sources of instability. They blame each other in familiar narratives, and keep on making and refining nuclear weapons, claiming that these are necessary to deter the other. But neither is being deterred, not from military conflicts or unbridled arms racing. In public statements reported after both sides undertook air strikes on each other's territory in Kashmir, Pakistan's president Imran Khan was shown on the BBC acknowledging that "given the weapons we both have", the two nuclear armed states could not afford miscalculations. Even as he called for both sides to "sit down and talk", Khan found it necessary to justify Pakistan's military strikes on the grounds that they were "to let them know that just like they intruded into our territory, we are also capable of going into their territory". India's foreign minister Sushma Saraj similarly warned about the dangers of escalation, while describing her country's military actions as carried out "with responsibility and restraint". Therein lies the central challenge. They know that they can't afford to escalate or miscalculate, but both have to appease their hard-liners. In wargames and exercises used for training and strategic planning by most if not all of the nine nuclear-armed militaries, these kinds of conditions light the fuses that lead to nuclear war. Deterrence theories were developed to justify nuclear possession with promises of safety and war prevention. In reality, these cannot be delivered. In its 2014 report "Too close for comfort", Chatham House analysed cases of "near nuclear use" and concluded that from 1962 to 2002, there were at least a dozen. For years these were minimised or kept quiet by the affected governments, but their military planners took the facts into consideration. While publicly espousing nuclear deterrence, which relies on accurate interpretations of data and an adversary's intentions and signals, as well as foolproof systems of communication (human and electronic), the military planners recognised that nuclear war is more likely to happen by accident than intent, fuelled by aggressive rhetoric, arrogance and foolish mistakes. As long as such weapons of mass destruction exist, they can be detonated through human and electronic authorization, error or – of increasing concern – cyber actions. The logic of arms racing combined with "use them or lose them" fears (dressed up as military doctrine) mean that if one nuclear weapon is detonated, more are likely to follow thick and fast. Whether authorized or not, nuclear weapons use doesn't come with much warning or an off switch. Chatham House identified two occasions of near nuclear use in South Asia, in 1999 and 2001, not long after India and Pakistan started overtly developing nuclear weapons in 1998. These were triggered by conflicts over Kashmir and Kargil. Despite hurling nuclear threats at each other's cities, both governments managed to pull back. Having shocked themselves as well as each other, they instituted confidence-building measures and "hotline" communications systems for key members of the military-political leadership, as the US and Soviet Union had done after the 1962 Cuban Missile Crisis. They also took credit for not escalating into nuclear war, and from then on justified having nuclear weapons for deterrence. Declaring themselves to be "responsible nuclear weapon states", they sought nuclear technologies that were supposed to be denied to them, since they have refused to sign the NPT. Over time, many have colluded in accepting the self-proclaimed status claimed by India and Pakistan, with some governments even supplying missiles and other technologies to boost their growing nuclear arsenals. As these nuclear-armed neighbours once again teeter on the brink of war, their first priority should be to end their nuclear arms race and establish bilateral and regional dialogue to resolve their mutual security threats and disputes. The conflict over Kashmir and most of today's ongoing grievances and hostilities originated in the toxic legacy of Britain's colonial mistakes and mismanagement, but adding nuclear weapons just makes everything worse. The clock cannot be turned back, so new thinking is required to move beyond that tragic history and find sustainable arrangements that avoid nuclear war, strengthen regional security, and meet the needs of people living on both sides of the line of control. No-one underestimates the difficulties, but India and Pakistan have to become partners in constructing sustainable solutions, since they cannot risk going to war with each other. As the Chatham House report analysed, deterrence (which, in non-nuclear strategies has been practised for millennia) is not failsafe. Mistakes get made, and at the interface between people and nuclear weapons, those mistakes can be very costly. Imran Khan appeared to acknowledge that if the conflict in Kashmir escalates, it could quickly move beyond the leaders' powers and abilities to control. Both sides know they have the capability to bomb each other to smithereens. But their rhetoric suggests they are in denial. They need to pay attention to the scientists and medical professionals from India and Pakistan who participated in the TPNW negotiations, along with many others. Dr Arun Mitra, Co-President of International Physicians for Nuclear Weapons, a co-founder of ICAN, yesterday called on the governments "to take immediate steps to reduce and eliminate the threat that their nuclear weapons pose to all humanity". Dr Mitra referred them to recent studies that demonstrated that if less than half of these two nuclear arsenals are used against cities they will kill millions of their own citizens through blast, heat, fire and radiation. Even more catastrophically, the nuclear strikes would create toxic dust clouds in the upper atmosphere. These would encircle the Earth for years, darken our skies and cause years of climate disruption and "nuclear winter". The consequence would be agricultural collapse, famine and death for up to two billion people around the world. The TPNW was negotiated in 2017 by the majority of UN Members to prevent such horrors and create a new framework of non-discriminatory prohibitions, obligations and steps to end reliance on nuclear weapons and oversee their safe elimination. India and Pakistan participated in many of the meetings as the humanitarian disarmament process got underway, but then chose to prioritise nuclear status over security by boycotting the UN's multilateral negotiations. They know the facts, however. Instead of risking nuclear war every time extremist violence is perpetrated against one of them, these two nations have other choices. They should seize the opportunity to sign the TPNW and other relevant agreements, pull back from the brink and lead towards greater regional and global security. From North Korea and the "P5" nuclear armed states to India, Pakistan and Israel, the fundamental truth is that there are no safe hands for these profoundly unsafe weapons. Since nuclear capabilities are the major risk factor, denuclearization is the direction we all have to take, sooner rather than too late.